If you have SBI account and need to apply for SBI ATM card then you don't need to visit your SBI bank branch to do the application process. If you have Internet banking facility for that SBI account then by sitting at your home you can easily apply for SBI ATM card within minutes. If you are thinking to apply for SBI debit card online then read on. 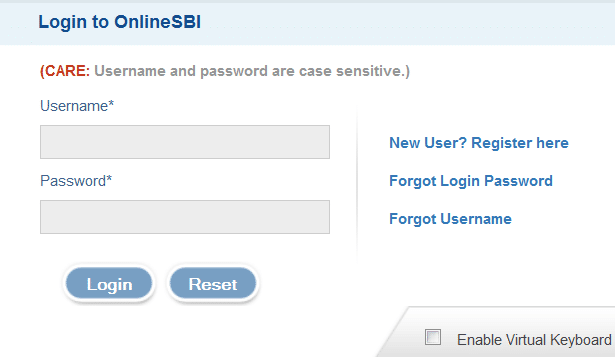 Step 1: Visit https://www.onlinesbi.com and Login to your internet banking account using your credentials such as user ID and login or sign-on password. Step 2: Go to "e-Services" tab situated at the top header menu, 6th from the left. Click on it. Step 3. Then scroll down to "ATM card Services" as shown in picture above or Go to left hand side, just below 'My Accounts' tab. You will find a set of services listed one by one. Go to the last hyperlinked text 'ATM Card Services' and click on it. Step 5: In the next page, for validation you have to choose one out of the two listed methods. You can select either 'Using OTP' or 'Using Profile Password'. If you select the first option, OTP will be send to your registered mobile number to complete the validation process or if you select the second option, you have to enter the profile password in the next page to validate the process. Step 6: Now, select the first mode for validation 'Using OTP'. In the next page you have to enter the OTP received on your mobile and click on 'Submit' tab to proceed to the next. Step 7: A new page will open up. Now you have to select the account for which you want ATM card to be issued. This is applicable when you have multiple accounts under one customer ID. Select the 'account' and go to the next step. Now type the name that you want to be printed on your SBI ATM card in the next empty box, just adjacent to the text 'Name on the card'. Now select type of the card required out of the available option in the next drop down button. The available options are MasterCard Gold Chip, MasterCard PayPass, MasterCard Platinum Chip, Visa State Bank Global, Visa Platinum Debit, Visa Gold Chip Card and Visa PayPass. SBI Visa Platinum Debit (International) is most demanded card as compared to others. Check the terms and condition section and click on 'Submit' tab. Step 8: Now, crosscheck the details and Confirm your postal communication address and click on 'Submit' tab to complete the process. You will receive message 'congratulations your card request has been recorded. you will receive your Debit card within 7-8 working Days at your registered address'. Now visit your nearby sbi atm and do small transaction via new atm, then change atm pin for your sbi debit card. sir, how to make username and password. Plz, resolve my query, Any balance required to be in my account for ATM card issuance charges? Applying for SBI debit card via Internet Banking is a very easy process, every SBI Internet Banking user can do this in a minute, But if we go to the branch for the same work than we have to spend our precious time. You have shared useful information and you are saving the time of many users. I also run this type of Blog LogicalDost. Sir Can use two ATM card for the same saving account number. I have applied for new sbi debit card online 2 weeks ago. Still, the debit card is not received to my address. Sir how to apply for sbi international debit card .. I have sbi classic card. 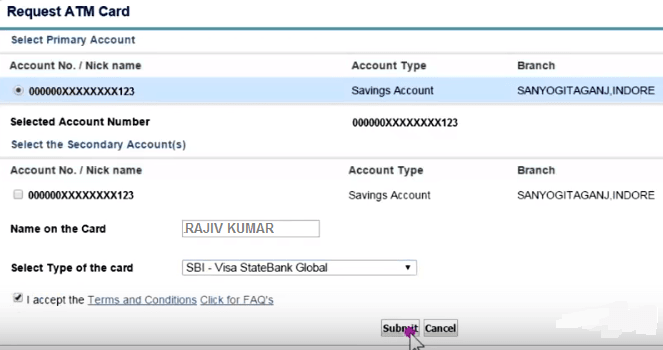 How To Activate/Login to Online SBI Internet Banking First time without a kit?